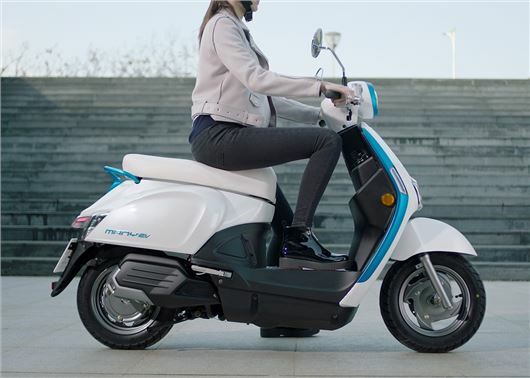 Kymco has unveiled its vision for the future of electric scooters with the launch of the Ionex. There are no details on pricing, but the scooter will reach the UK in late 2018 and have a range of up to 125 miles. Looking like a standard scooter with 10-inch wheels, the Ionex uses an innovative battery system that is key to its versatility. Under the foot board are two 5kg battery packs that can be lifted out and charged individually or removed as a pair due to handle design. >>>What kind of licence do I need to ride a scooter? As well as these batteries, there is a ‘core’ battery that stays in the scooter permanently. When the removable packs are reinstalled, they automatically charge up the core one so it’s always ready to be used. This design allows the rider to remove the batteries for charging yet continue to ride for a short distance, such as commuting in town. Kymco says this is the first EV scooter that you never have to wait to use until it’s recharged. Kymco says the removable batteries have been deliberately designed to be light enough to carry. They are also simple to remove as the lid opens via a button on the right-hand bar. It then glides up to give unhindered access to both batteries. The lid can be closed by tapping an integrated smart button on the foot board so you don’t have to put the batteries down. You can also use this button to reopen the lid when installing the battery pack. The Ionex can also be charged in the same way as other electric scooters by plugging in a lead from a charger. Or, you can remove the batteries to charge at home or work. Kymco is also introducing its Power Outlet Network that works like a vending machine. The rider slots in their scooter’s batteries to charge and collects them when they’re needed. The company says this overcomes the problem of trying to install charge points at every parking space. A Charge Point Network is also planned of local shops and businesses that will let you use their power outlets to recharge the batteries, which takes around an hour. It made its debut at the Tokyo Motorcycle Show and is part of a plan that Kymco says will see it introduce 10 battery-powered models in the next three years and it aims to sell 500,000 of them globally in that time. Ar the battery packs easy to steal ? He/she loads them arriving at work and collects leaving work thus blocking machine all day. How is this to be prevented? Fines if left in after fully charged?